Disaster: It's not a question of "if", its a matter of "when." Whether it's a natural, man-made or cyber disruption, your organization needs to stay one step ahead and properly identify threats, analyze the risk and then implement plans to avoid or recover from events. Use this IT disaster recovery checklist to assure your company is prepared for an emergency. 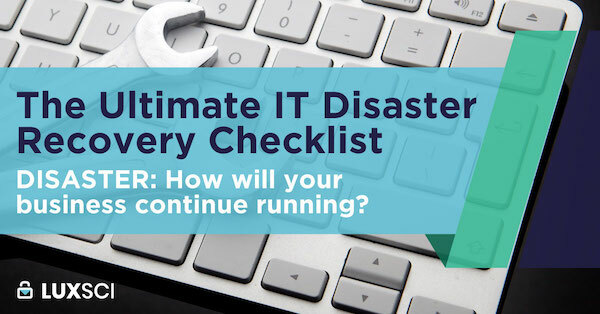 Whether you want to assess your current IT disaster recovery plan or start a grassroots recovery process, refer to this checklist to discover what's needed to prepare for and respond to threats. Download the free checklist today! Subscribe me to relevant news from LuxSci. Are you an existing LuxSci customer? If so, what is your account? What do you hope to use this checklist for?